Email Tagalog Meaning: What's The Filipino Translation Of The English Word Email? 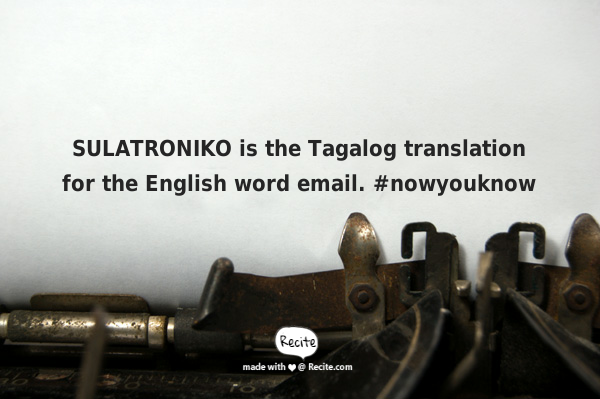 Although it's rarely used by Filipinos in the Philippines or by those living abroad, the Tagalog translation of the English word "email" is "sulatroniko". Just like email which is a combination of the words electronic and mail, sulatroniko is a combination of the words sulat (mail) and elektroniko (electronic). Sulatroniko is considered to be a neologism. That is "it's a relatively recent or isolated term, word, or phrase that may be in the process of entering common use, but that has not yet been fully accepted into mainstream language." [Source: Wikipedia] These new words are often directly attributable to a specific person, publication, period, or event. You can read more about neologisms here. 1) Did you receive the email I sent you? - Natanggap mo na ba yung pinadala ko sayo na sulatroniko? 2) I'm sorry, I've only read your email this morning. Sorry for the late reply. - Pasensiya na, nitong umaga ko lang nabasa yung sulatroniko mo. Pasensya na sa di pagsagot ng mas maaga. 3) I will send you an email once I finish my research. - Padalhan kita ng sulatroniko pag natapos ko na yung aking pagsasaliksik. Now, the question is should you use the word or should you stick with the English version? It's good to study the evolution and development of these words but it would benefit you more if you stick with "email" even if you are writing a Tagalog document. Most people in the Philippines aren't even aware that the word sulatroniko exists.